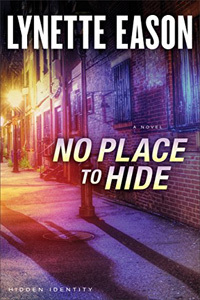 No Place To Hide by Lynette Eason: Synopsis and Online Purchase Options. Synopsis (from the publisher): It's not every day you see your childhood friend and onetime crush on national news. Jackie Sellers just wishes it were under different circumstances. She can't believe that Ian Lockwood is wanted in connection with a terrorist plot, and she's determined to find him and help him clear his name. Unfortunately, she's not the only one looking for him. The FBI wants him captured. The bad guys want him dead. Ian just wants to stay alive long enough to prove his innocence and prevent a catastrophe.